Almost by definition, an acoustic blues in E is the original blues. Done right, it can send a shiver up your spine. If it’s below par, it can be incredibly boring to listen to. Boring an audience is the cardinal sin of any performing art and playing acoustich blues guitar is no different. That said, the blues in E gives guitarists a bit of a problem, particularly an acoustic guitarist playing alone. 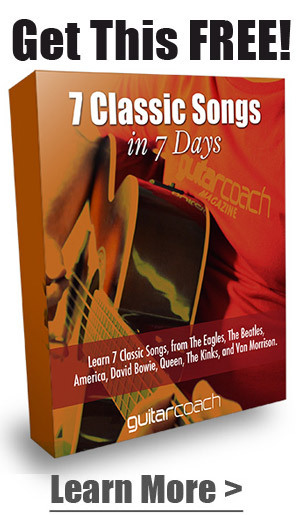 There are only three basic chords, namely, E, A(7) and B7. 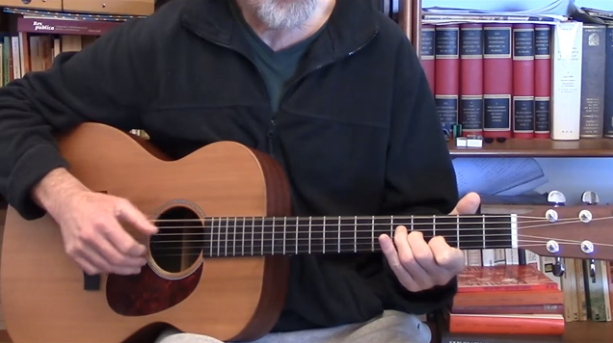 Of course, there are inversions and hybrid variations, but if you stick to the basic chords (and many classic blues men did), then it’s sometimes tough to make it interesting. 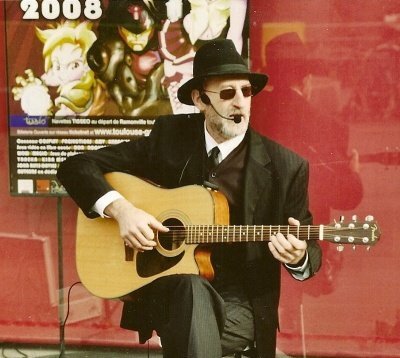 My first experience of acoustic blues was in a UK folk club in the ’60s. It was basically a shuffle with no embellishments and no redeeming features. After spending many years playing ragtime blues and Scott Joplin pieces I re-discovered the blues in E and A played by Lightnin’ Hopkins, Mance Lipscombe, Big Bill Broonzy and Robert Johnson. The skill with which they created freshness out of basic chords fascinated me and I changed course into the ‘real’ blues. ‘Lightnin’ Hopkins, Mance Lipscombe … they created freshness out of basic chords’. 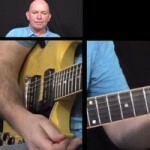 For this guitar lesson I’m going to take the basic chords and create a blues piece, showing how to add those subtle links between the chords that make all the difference to the listener. Once we build up a repertoire of these chord-linking fills, we can change the pattern every verse of a song and it suddenly comes alive. The structure is always the same so the listener is comfortable, but each time around there’s a new variation waiting, which means people are wondering what’s coming next as well – a perfect combination for maintaining interest. ‘Each time around there’s a new variation waiting, which means people are wondering what’s coming next’. Above all, whatever you play, maintain that old blues feeling, possibly the hardest thing to learn in the first place! Editor’s Note: Sadly, our site doesn’t support the click-and-play function for images intended by the author. 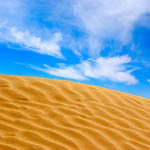 Clicking on an image will show the full image file to make the tab easier to read. Click the play button on the audio file below each tab to hear it played out loud. Tabs revised for accuracy on 5/27/2016. Use the ‘heartbeat’ monotonic thumb strike – starting with the E chord. A simple pattern to balance the bass work of the previous section. Back to E – almost the same as section 1. On to the A7 chord. Back to the E chord. Run up the basses to the B7 chord. Spend a little time on A, using a bar. Finish off with a good old blues end tag and turn around ready for the next verse. The trick is to explore and find other patterns you can use to replace the ones I’ve shown. For example, you could move right up the fretboard to a chord inversion of one of the basic chords, or double up on the timing when playing the treble strings. The structure is full of possibilities, and when you find your own variations, then your music will be truly authentic and unique to you. Finally, a word about a powerful tool for learning guitar, or anything at all for that matter, is the application of your imagination and visualization. For 10 minutes before you drift off to sleep at night, really see and feel yourself playing fantastic guitar. Go over the things you practiced that day. See your fingers moving effortlessly over the strings in vivid colour and close up. Hear the music loud and vibrant in exactly the way you want to perform it. When playing the old blues, imagine yourself in an old juke-joint. What does it feel like to be one of the original classic blues men? Imagine their trials and tribulations and how it was expressed in their music – BE one of those blues men. Of course practice and repetition is essential for those muscle memories, but the power of visualization is often overlooked and will work wonders for you if you apply it regularly and with focus. 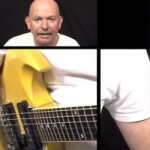 Jim Bruce learned his craft by playing on the streets for a living and was voted the #2 top Internet guitar instructor by Truefire.com users in 2013. 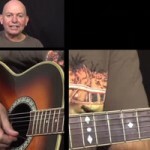 You can find more of his acoustic blues lessons on play-blues-guitar.eu. Hi, Jim. I’ve been learning to play blues for a few years, and I think your tips are very useful. My favorite part is about imagining yourself an old bluesman while playing. To me, it helps a lot and gets really gets you inspired. I did write a similar article on my blog (https://beginnerguitar.pro/how-to-improvise-on-guitar-guide), I wonder what you think about my tips. The tab does not seem correct. In the E sections, it shows 2 bass notes on the open E, followed by a D chord inversion (F#, A, D; 4,2,3). In the video, it looks like you are playing G, B, D, (5, 4, 3). That also sounds more like what you are playing. Is it a typo in the tab? Yes, you’re quite right – well spotted! Excuse me for letting that one slip through – tab images 1, 3 and 5 will be changed pretty soon, and I sincerely hope it hasn’t spoiled your enjoyment. 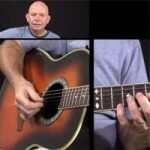 Very nice lesson easy to follow and great tabs! What your playing does not seem to match the tabs, getting a little confused, but I really like the sound of this.